The Federal Reserve raised rates on Wednesday in its first meeting under Chairman Jerome Powell — a sign of confidence that the economy is growing stronger with very low unemployment and rising wages. "The economic outlook has strengthened in recent months," the Fed said in a statement following its two-day Federal Open Market Committee meeting. The Fed lifted the federal funds rate, which helps determine rates for mortgages, credit cards and other borrowing, to a range of 1.5% to 1.75%. That was an increase of a quarter of a percentage point. It was the sixth increase since December 2015, when the Fed started tightening monetary policy for the first time after the financial crisis. Rates are still extremely low by historical standards. The country's bright economic outlook had raised investor expectations that the Fed would accelerate this year's planned rate increases to keep the economy from overheating. But the Fed showed it's not ready to speed up just yet. Instead, the central bank stuck to its plans for three interest rate hikes this year, reinforcing the message that it plans to maintain gradual increases. But the Fed signaled it may favor a more aggressive pace to keep the economy humming in the coming years. It shifted its plans for next year, calling for three more rate hikes instead of two. "We've made one decision at this meeting and that decision was to raise the federal funds rate by 25 basis points," Powell told reporters at his first press conference. He said economic forecasts can change, and the Fed could be "a little less gradual or a little more gradual" when it comes to future interest rate decisions. Fed officials were split on whether this week's policy meeting was the appropriate time to announce a fourth rate hike in 2018. Central bankers did offer hints that they may be inclined to raise rates more frequently this year to keep the economy from overheating. Nearly half of FOMC members now believe that will be necessary if the economy keeps performing as well as they expect. For years after the financial crisis, the Fed kept interest rates near zero to support the recovery. Then it began to raise rates only slowly, starting in 2015. 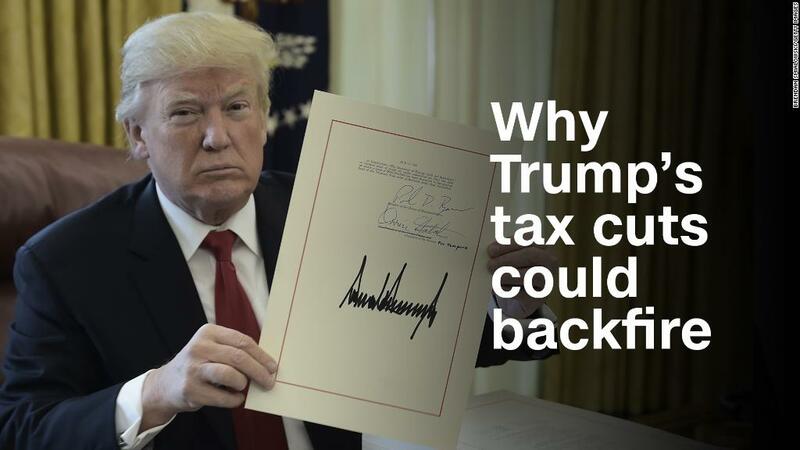 But an improved economic outlook, accelerated by the recent $1.5 trillion tax cut and $300 billion spending bill, has more recently changed that calculus. "We're trying to take the middle ground there," Powell said. Powell's job is to keep the economy churning without starting a recession during his four-year term — a risk the Fed chair said he does not see as imminent. The unanimous decision on Wednesday's rate hike signals to Wall Street that Powell, for the time being, will stick with his predecessor Janet Yellen's plans for gradual rate increases. The policy move leaves central bankers with room to assess whether they will need to raise rates faster to prevent the economy from overheating. The Fed now expects faster economic growth this year — 2.7%, up from a forecast of 2.5% in December. That was before Republican tax cuts were enacted and lawmakers made a deal for $300 billion in additional government spending. Policy makers also maintained their inflation outlook of 1.9%, slightly below the Fed's target. Powell dampened fears that inflation could take off if the unemployment rate remains low. The Fed now projects the unemployment rate to fall to 3.8% this year. It now stands at 4.1%. "There's no sense in the data that we're on the cusp of an acceleration in inflation," Powell said. "We're very alert to it, but it's not something we observe at the present." The Fed's preferred gauge of inflation stands at 1.5%. But central bankers expect it to "move up" this year, and data show it was already "a little bit higher" by the end of last year. Policy makers said Wednesday they now expect inflation to rise above their 2% target next year and in 2020. Powell was pressed by reporters on how the Fed would respond if inflation were to rise above its 2% target. Officials have said their target is symmetric, meaning they would be comfortable if inflation was below or above 2%. For now, Powell said policy makers hadn't reached any agreement on how the Fed might respond to prevent the economy from overheating. Powell, asked about President Trump's tariffs, said the Fed did not believe changes in trade policy "should have any effect on the current outlook." But he did not that business leaders had expressed concern to Fed officials. The Fed chair said ongoing trade disputes are now "a more prominent risk to the outlook" than before. He refrained from answering questions on a potential trade war between the United States and China.